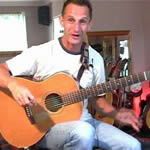 Learn finger picking II with this Guitar Tuition DVD. This DVD continues where DVD 1 left off. The main focus in this DVD is adding a MELODY line to your finger picking style. 1) Keeping two chords going while improvising a melody on top. 2) Melodies on top of common chord progressions in ALL keys(without capo). 3) Using pick as well as fingers. 4) Placing melody in lower strings. 5) Taking a a common tune and incorparating that into tha picked chords.